Lake Mashu-ko is one of Japan's most pristine lakes and situated in Akan National Park. 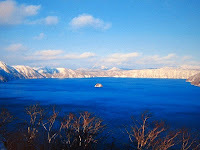 Lake Mashu-ko is volcanic lake sixth large in Japan. Located nearly 15 kms south-east of Kawayu Onsen is the most pristine lake in Japan, the Mashu-ko. 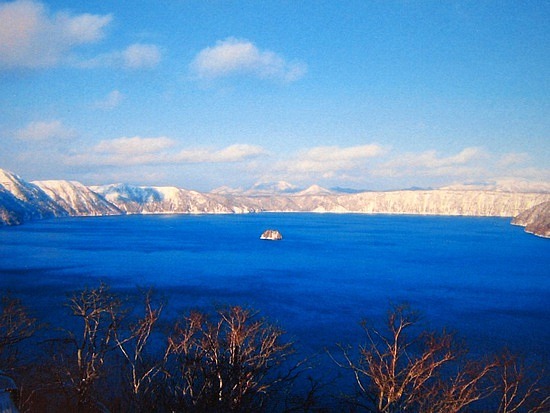 Lake Mashū is surrounded by steep crater walls 200 metres (660 ft) high. It has no significant inlets and no outlet. It is internationally famous for having the highest level of clarity in the world. It features the most beautiful transparent emerald-colored surface that changes moment by moment. Although there are three observatories around the lake, heavy mist often obscures the lake surface like an immaculate deep-blue velvet. Thus, the lake is generally regarded as being hidden and inaccessible, and is sometimes called "the mysterious lake." The lake is also known for heavy fog, which frequently covers it up. In summer, the surface of Lake Mash is often obscured by fog. This have given the lake a reputation for mysteriousness. Local legend says that if you can see the surface of the Lake, you will have bad luck.There are two observation decks from where you can enjoy beautiful views of the lake on clear days. The isle is the peak of a lava hill which rises about 230 meters (755 feet) from the bottom of the lake. The Ainu people who have long lived here call the isle "Kamuishu," which roughly means "Island of the Gods."